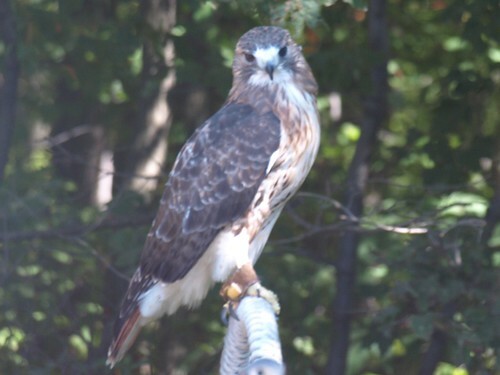 The other day, Deb and I were out on the porch to discuss some things without distraction (yeah, you could pronounce "distraction" as "Mr. B" =), and we watched our young neighborhood red tailed hawk soar low across the front yard with mouse (or maybe chipmunk) in hand. Or foot. Or talon. I may not have been able to catch the booger on film, but he was most definitely a red tail. This morning, Deb was out on the porch, sipping her coffee, and noticed Tika stop eating. The cat turned, looked out under the hosta, and leaped through the railing. She came back with a mouthful of green feathers that had, a few moments ago, been a sparrow. So today was the makeup day for the string-trimmer fest set for last Saturday... naturally, no rain in the forecast last night... ummm, early this morning... and, naturally, when I wake up it's "light showers" and everything is wet. Cold and wet, no less. While I was loading the truck it looked, for a moment, like it was debating being snow, or at least ice. Just took the one string trimmer - the heavy duty one is currently down and out. I think it has some homemade varnish in the tank. I had it running the other day and it actually kept going for a few minutes. Couldn't get it started, and you don't want that when you're half mile along the trail. aequitaslevitas was out of commission - he caught the cold that Mr. B had, and he caught it from Rachel - so it was a solo mission. Joined up with a couple of the guys from the Allentown Hiking Club on-site, though, and we took to the trail. Apparently, just before I pulled up, I missed the golden eagle - or a large immature bald eagle - that hung around at eye level off the side of the parking lot. (You can kind of see the view in this shot of aequitaslevitas from back in July. It was still raining when we were getting ready, but that stopped at some point in the first thousand feet or so of the trail. Shortly after that, I realized I'd better go back and grab the gas can so I could minimize the distance backtracked for fuel. Also removed the coat, on account of no rain and plenty of warmth. Most of the trail was cleared nice from our earlier efforts so there were spots we could just cruise through. Trailhead to trailhead, on the access road, is more than a mile, so the trail - which goes up and down the side of the ridge - is probably on the order of 1.5 to 2 miles. Much fun lugging along a metal two gallon tank of gas and a string trimmer! Might look into a gas backpack (they make them for wildfirefighters) sometime down the line. Found a bear run - or, possibly, it might have been made by a hippopotamus or a 500 lb. otter. It was a clearer trail - and flatter! - then the one we were making. Looked like a three to six foot wide streamroller went down the mountain. During the debriefing with Dan back at the Osprey House, we had an immature bald eagle give us a nice flyby. Of course, the camera was back at the truck. Oy. Had a falcon or hawk outside the bedroom window later in the afternoon, but when I went out with the camera, the only thing I saw were mushrooms and fall foliage. I couldn't even get a bead on the crows that circled when I was going in! Click through for the rest - this one is the first in the set. We're still not sure what's happening for tomorrow; I do plan on attending the HawkFest and the work day, though. More info and directions at the Lehigh Gap Nature Center web site. The sleep test on Thursday night into Friday morning left me more exhausted than I had thought - on initial reports before leaving the sleep lab I described my current state of being as "awake" and "alert" and "not tired" and "not sleepy". I was only fooling myself though. I forced myself to stay up a bit while the guys were working on the septic tank, and then I was out for a nap. Deb drove Justin down to his friend's house in Bethlehem and then went for a night out. Rachel, Mr. B. and I hung out and then went to sleep. Saturday, Rachel performed at a kick-a-thon to raise money for a local kid and Dreams Come True. Forecasters called for a nice cool day, suitable for a couple hundred kicks, but the sun and clear skies had other ideas, so it was quite hot in the Wal*Mart parking lot where it was held. Rachel got in 200 kicks as well as worked the door to collect additional donations, and then she headed over to soccer for drills and a game against the high school kids that were teaching them. Deb had told her to focus on the kick-a-thon, and she could sit out the game, but she played through it all despite being quite exhausted. I had some stuff planned for Saturday, but I just hung out with Mr. B - I couldn't get going in the AM, as I was still off-kilter from the sleep study. Sunday, Rachel and I went to Bake Oven Knob, joined by noone234, to watch hawks. We saw a few in the sky, and had an enjoyable time up on the ridge, but the highlight was seeing a few birds quite close - the Carbon County Environmental Education Center had brought birds that were unable to be released back to the wild - including Tecumsah and another that you can see if you click through that picture. The pictures of the kestrel didn't come out very clear, so they weren't posted. January 14 -- 8:00 a.m. Winter Bird Walk. Leader, Jeff Frantz. This is the first of a new series of bird walks to be held on the Second Saturday of each month. See wintering birds as well as other general nature observations. If we have some snow, we may be able to find otter tracks at the ponds. This event will be cancelled if the weather is bad. Teams will survey the bird life in northern Lehigh and Southern Carbon counties. Form a team or show up and join one. There is some fun competition here while we gather data for an ongoing study. With this very warm winter weather, who knows what we might find. Winter Raptor Survey -- surveys in Carbon and Lehigh by car. Contact us if you want to help. Can be done the last week of January or first week of February. February 10 -- 8:00 a.m. Winter Bird Walk. Leader, Dan Kunkle. Note that beginning in march, the starting time will be 7:00 a.m. for the bird walks. Hope to see you at the refuge. No experience necessary -- we welcome inexperienced birders and can provide binoculars as well. These events are open to the public, so feel free to tell others about these events. Eagles and Hawks and Geese, oh my! Bake Oven Knob has two lookouts, north and south, and, depending on which way the wind blows, the birds will travel by one or the other. When we didn't find anyone at the south lookout, I said we'd head to the other - a couple of folks came with me, but they stopped on the north side of the ridge - about a 15 minute climb down then up again from the north lookout, where everyone was. In the first few minutes I was there, I saw several red tailed hawks and my first-ever golden eagle (in the wild; I've seen them at close range several times in recovery.) The north lookout is on a very thin ridge, and actually commands views in both directions, if a little more daunting to reach. I waved at the barely-visible south lookout, although not, apparently, at anyone I was with. During the time I was there, about 60 birds went by, including an adult bald eagle, some sharpies, many red tails, and some broad-wings. A couple of golden eagles went by just after I left. I did manage to get word back to Deb, Justin, Debbie, Zack, CJ, and Rich, and Deb and Debbie came partway down the ridge and called me back. From where they were, they saw nothing - none of the eagles, hawks, and not even the line of geese that soared over the notch about three glasses up - in other words, right in front (and above) their faces. They did not believe me, until another confirmed that in the short time she'd been there, she saw thirty birds, including the bald eagle (which was close enough to be visible to they eye,) and they saw her heading up to the lookout so they knew she hadn't been there long. On the way back, we saw two airports (i.e. grass fields,) some horses, a handful of deer, and a parasailor. The food seemed to be enjoyed - The Intripled Potato went over well, as did the Cattleman's ribs. Debbie brought muffins for breakfast and CJ made cheesecake for desert. Rich brought some donuts to add to the breakfast feast. Temperature out on the ridge wasn't bad - although it did drop to 39F (not including windchill) shortly after I made it to the north lookout. There's still a couple of weeks before the dinner on the 18th, but I thought I'd give a heads-up as to the schedule. As it will be a little colder than last time, I'm sure most of us won't want to sit on the mountainside subjected to the mid-November weather for a whole day. So instead we'll only freeze to death watch hawks for a small portion of the day. We will meet at my house at 9:30am for a late breakfast of The Intripled Potato (known in less explorerey circles as "hash browns") and then we'll head over to Bake Oven Knob for a few hours, before turning tail and running back to the warm house for some kind of hot food. Possibly the Cattleman's ribs. Maybe a hearty, homemade beef and barley soup. But something warm and filling. So, any suckers? who's coming? Tomorrow is the November breakfast, hawk watch, and dinner. I don't expect it to be as cold as I had first anticipated, but we're sticking with the warm, hearty meal concept. The Intripled Potato and Cattleman's ribs are definitely on the menu for the two meals. I am extremely hungry, but that is mostly because I cooked up some kielbasa yesterday, drove 45 minutes with it in the backseat calling out directions (mostly things like "pull over" and "aren't you hungry?" and "why, don't I smell good enough to eat?") and now I can smell it warming up for our office Thanksgiving feast. Yum. The car was back to life a bit - started right up when Justin and I stopped on the way to the market last night. That means the battery is good but the alternator has probably shed its electrical coil and is in car part heaven. The only bad news with this is Deb spoke a lot about waking up early and driving over and then following me to the garage - unfortunately, when I came down this morning, she was still in bed, and wondered why I didn't tell her what the plan was (funny, it was her idea I thought we were going with...) So now not only will the car likely sit there all day, as she won't want to put a neighbor friend out, I am at fault for this because I didn't wake her up, and I didn't wait when she said she wasn't ready to wake up, and so forth. So. Current Music: Yngwie J Malmsteen's Rising Force - Attack!! Sharp-shinned hawks ruled the day, with a few Cooper's hawks in there, a couple of osprey, a merlin, the usual rogues gallery of black and turkey vultures, and a young bald eagle. Several of the sharpies came in low over or behind us. 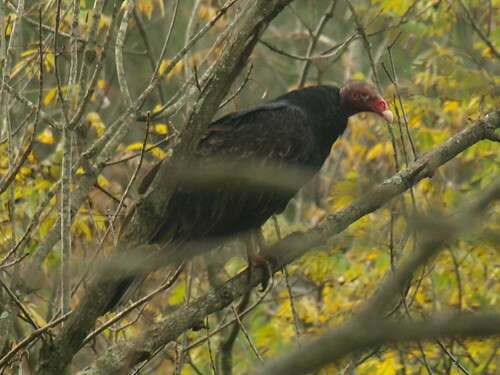 One of the turkey vultures was convinced at least one of us was roadkill, and kept circling about ten-twenty feet away. The weather was, as advertised, clear turning to partly cloudy. It was actually colder at the parking lot than it was stuck out in the wind on the edge of the ridge. Of course, when that partly cloudy rolled in, patches of cloud equaled patches of shadow equaled patches of cold. No bears were sighted until now, as a show on PBS discussed black bears living in proximity with people in, and this will be a complete surprise, ta-dah! the Poconos, in Pennsylvania. Looks like it should be a nice, clear to partly cloudly - if a bit brisk - day for the hawk watch. If the wind prediction holds, I believe we'll be on the north lookout. It's almost been a year since I first - and last - visited the north lookout. Winds have usually been more favorable to the south side. Which actually brings me to another topic of which I will post separately, as it is Important and deserves its own post. I'll be at the Moravian Book Shop for the poetry circle tonight - then I'll roast up some peppers and onions and garlic. I'll make the pico de gallo fresh tomorrow morning before setting out. We're trying to see if my sister-in-law can watch Brandon so Deb can go - she hasn't been to Bake Oven Knob yet. It will likely be a few more years before I'm comfortable bringing Brandon up there. Mr. B (sing-songy): "Nooo beh-ahd." Mr. B (invoking Spanky, almost): "Ohhhhhh kaaaaayyyyy." He had great fun invoking this repeatedly anytime he was prompted. Oh, and his new word of Yesterday: "Armadillo." He hits all four syllables in the correct sequence and fairly clearly. HawkFest is up first - we went over to the trail head near Bake Oven Knob and talked with the good folks from the Wildlife Information Center. Justin and Rachel were able to handle a corn snake and a couple of turtles, as well as look at a number of other local critters, including a just-hatched-that-morning turtle. You could still see his bellybutton, which will disappear as he grows older. Over the course of three hours, we sighted nearly a dozen osprey, almost half a dozen broadwings, a couple red tails and sharpies, and about forty or so turkey vultures. We headed down to CelticFest, and, after looking everywhere else, finally tracked down the clans. Two were left, and only five or six had even shown up. They put them in an out-of-the-way low traffic spot, away from the music. With less people stopping by, and less of a chance to be in the middle of the festival, you can't really blame them. I'm not sure Clan Riddell would have been represented under the best of circumstances - they don't seem to be as active as some and they only show up on a few of the many clan listings. I also stopped by The Harp and the Dragon and discussed Uilleann pipes - downright affordable at only $1675 for a full set. And yes, one of the things that I discussed with Ann was that it's best to start with a starter set and then add the drones and regulators. And, if I ever happen to get good at them, I can always get a set from Seth Gallagher (for comparison, the starter set can cost more than $1825... =) Ann had mentioned used sets - mostly from people who ordered the half or full set and then gave up learning to play it because they didn't start simple - but I wasn't able to find mention of it on their site. As these are bellows-powered, I would have no problem considering a well-priced used starter set or more, if it was really well priced - I would just remove the extra stuff until I became somewhat competent. Although I suspected, just from looking at it, I made sure I verified that there is no correspondence between the chanter of the uilleann pipes and the chanter of the highland pipes (which I will be picking up when I go to MA this coming weekend.) Learning one won't help much with the other, except, I suppose, on the basic level of putting your finger over a hole or releasing it and having that change the sound. As we didn't get much information about the clans, we did try several of the heraldry vendors, only to find the same canned information. They really can't provide anything more specific for the $10-40 they offer products for. I'm starting to recognize the language used, about how they imply much without providing specifics - The Warren Family book we have consists mostly of that sort of thing. It's kind of sad - I kept looking at it (as I have done in the past,) hoping it would reveal some Great Secret but knowing that it was too generic and too vague to do anything. For that, it takes going through census records, marriage records, and so forth. Anyway, because of that it wasn't much of a disappointment - expectations were not very high, and they were met. Despite the rain earlier, we're going to go to Bake Oven Knob for the HawkFest. We bagged the Celtic Classic - you know, we were really spoiled by the regularity of the Greater Bethlehem Scocer League - practice, then a game, every Sunday during the season. This area's league changes practices and games on a whim. Yesterday's game miraculously appeared on top of our scheduled event. By the time we got situated from that, it was too late - Brandon went down for a nap, and five minutes later Rachel got back from the game. We waited a little, and then discovered all of my jeans were in the dirty laundry. By the time that laundry was done, it was a good time to wake up Mr. B but too late to bother heading down to the fest.